Haven’t you heard? Well, no, you probably haven’t if you’re a peasant. But if not, you’ve probably heard this tip making the rounds in the elite circles: Changing clothes is for the poors, and having a suit that can handle every weather condition that this unfair life throws at you is the new thing. That’s why Alfa Romeo came to the rescue of the terribly mistreated white-collar segment of society, with a “high-performance” suit for any weather. It’s based off of the all-weather mode in the Giulietta, which has a starting price of $29,900—you know, the kind of change that falls out of your wallet on those sleepy mornings when the hired help isn’t there to buy coffee for you. That means the rain will roll off of you like you’re untouchable, because really, you are, and ponchos and rain coats are for the lesser anyway. It’ll also protect you from those pesky swings in temperature with a lining that adapts to the warmth of your body, preventing you from breaking the slightest bit of sweat. Sweat is gross, remember, and there may not always be someone at your side to wipe your face off at every hour of the day. Tragic, we know. The only pressing problem that this suit doesn’t solve is holding your umbrella for you when no one else is around to do it. But whenever someone is around to dab your forehead or shield you from the rain, they’ll be fortunate enough to get close to your carbon-fiber suit buttons (which are for looks rather than weight reduction, since we know you have that fancy yoga-studio membership that costs more than some families’ grocery bills), honeycomb-grille mesh lining and red contrast stitching to match the sporty accents on the car. 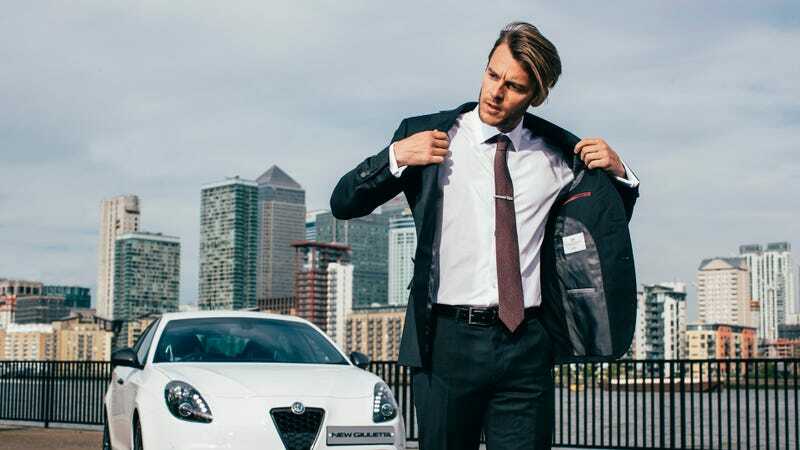 The Giulietta accessories continue with the logo-laden Alfa Romeo tie, pocket square, cufflinks, lapel pin and tie slide, which show everyone how cool and suave you are because your attire matches your car. It’s not an advertisement at all, because you are far too good to be a walking billboard. There’s also a women’s shirt for your side piece that features the “fluid lines of the car which was echoed in the soft curvatures on the collar and bib,” because women are soft and fragile and there to stand slightly behind you in just one of the featured press photos. Since this is about the suit, the women’s attire is worth just a single paragraph aside in the entire press release. Moving on now. The suit is just a concept without a price for now, since that’s how all great automotive ideas start. But the cheapest suit on its British tailor’s website is $339, which, if you plan to buy an Alfa-branded one, probably isn’t much more than what you spend on each of your many, many money clips.